Voice assistants are the name of the game at CES 2018. Across the Las Vegas tech show, you’ll find LG TVs, Acer laptops, Asus routers, and even cars all getting bundled with Amazon’s Alexa assistant. But probably not many people expected a projector with native Alexa support. 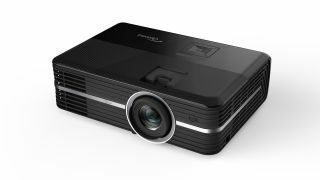 Enter Optoma, which TechRadar said rewrote the rules on 4K projectors with the inexpensive Optoma UHD60 last year. It's continuing to focus on making “accessible, mainstream” products for customers, and now it's releasing the UHD51A: allegedly the first projector integrated with the Alexa assistant. This 4K, UHD projector can display 2,400 lumens with a 500K:1 contrast ratio, and delivers an HDR10-quality spread of colors. Along with Alexa Smart Home, it comes equipped with a 4K UHD media player, an Android OS and two HDMI 2.0 slots that support 60fps gaming. With the UHD51A, you may not actually need an Amazon Echo or its brethren. Optoma claims the projector’s Alexa suite lets you “fluidly align with speakers, screen, lighting and more”, so it appears you can control your whole home through the projector, not just your film nights. You can expect the UHD51A by the end of March for $1,699 (about £1,255 / AU$2,165). Its brightness and contrast sit below that of the UHD60, but considering the reduced price and voice integration, many customers will gladly accept this downgraded 4K model. As far as we can find, no other projector offers built-in voice controls ... yet. In addition, Optoma has announced several projectors that lack Alexa support, but compensate with power or mobility. The Optoma 4K UHD HDR Laser UST uses a laser light source to project 100 inches of light from just eight inches away from any wall. It comes out in the second quarter of 2018 for a whopping five grand, but Optoma is justifying the cost with a two million to one contrast ratio, HDR compatibility and a low energy footprint for such high specs. On the other end of the spectrum, Optoma’s LED Pocket Projector sits at 3 x 4.5 inches and 12 ounces, and can apparently play movie-length streams at decent quality before its tiny-sized battery gives out. It'll retail for $279 (about £205 / AU$355) in Q2.